Yu Hsiu Ku was born in Wusih, Kiangsu, China, on December 24, 1902. After graduating in 1923 from Tsing Hun College, in Peking, he received a scholarship for study in the U.S., at the Massachusetts Institute of Technology, where he earned the degrees of Bachelor, Master, and Doctor of Science in 1925, 1926, and 1928. After a brief period of employment with the Westinghouse Company as an electronic engineer, he went to Schenectady to serve as a member of the Engineering General Department of the General Electric Company, under Robert E. Doherty. Early in 1929, Dr. Ku returned to China, visiting England, France, Germany, and Switzerland en route; and became head of the Electrical Engineering Department of the National Chekiang University in Hangchow. During a 2-year stay here, he was a founder of the Chinese Institute of Electrical Engineers, and served as the editor of its Journal. In January 1931 he went to Nanking to be the Dean of Engineering at National Central University. From 1982 to 1937 he was Dean of Engineering at the National Tsing Hua University in Peking, his Alma Mater. While there he founded both the Aeronautical Research Institute and the Electronics Research Institute. During the Sino-Japanese war, Dr. Ku served for six years as Vice Minister of Education for China, when he was largely responsible for moving many universities to the interior, and for keeping the faculties and students together. He was awarded the Medal of the Bright Star and the Victory Medal for this work. In 1944-5 Dr. Ku became president of the National Central University in China's wartime capital, Chungking. After the war he was appointed Commissioner of Education, in Shanghai, and was invited by General MacArthur to tour Japan in 1946. Then, he visited the United States, England, France, and Switzerland and headed the Chinese delegation to the International Technical Congress in Paris. In 1946 he was elected a member of the General Assembly of the International Union of Theoretical and Applied Mechanics (IUTAM). 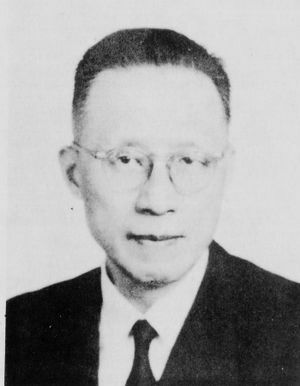 When the Chinese national government moved to Taiwan, Dr. Ku came to the United States to serve as visiting professor at his second Alma Mater, M.I.T., from 1950 to 1952. He was then appointed Professor of Electrical Engineering at the Moore School of the University of Pennsylvania, where he continued until his retirement in 1971. Despite his arduous duties and wide travels, Dr. Ku published nearly 100 technical papers between 1926 and 1971. To honor his 70th birthday on December 24, 1971 (the Chinese count the day of one's birth as the first birthday), 96 of his Chinese friends joined in publishing Ku's collected papers, 95 in number, in a single large volume. In the years 1958 to 1962, Dr. Ku wrote 4 books dealing with transient analysis, the control of linear and nonlinear systems, and electric energy conversion. He has earned distinction in the literary field also, by writing many essays, novels, plays, and poems during the past 50 years. His complete literary works were published in 12 volumes in 1961. Some of his plays were performed in Chungking during the Sino-Japanese war, and his poems have been sung by the Chinese Youth Choir in New York in 1971. Dr. Ku won many awards and recognitions for his work, including the IEEE’s Lamme Medal in 1972. At the age of 99, Dr. Ku died in Oklahoma City, where he had moved to be with family. This page was last edited on 15 February 2019, at 19:17.